Fill hearts with happiness! 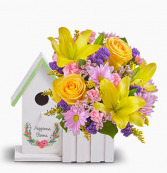 This mini bird bungalow features a vintage picket fence and a delicate watercolor design filled with a garden of our freshest blooms. Gift Delivery in Fort Worth, Arlington, Benbrook, Burleson, Colleyville, Crowley, Grapevine, Hurst, Keller, Mansfield & Southlake, TX.